iPhone magic - FBI needed this magician! In 2017 Dan performed in Shanghai, Las Vegas and Germany for Bomag, book today and find out why! Dan's 10 year old son James performs with him and he juggles fire and 5 balls! 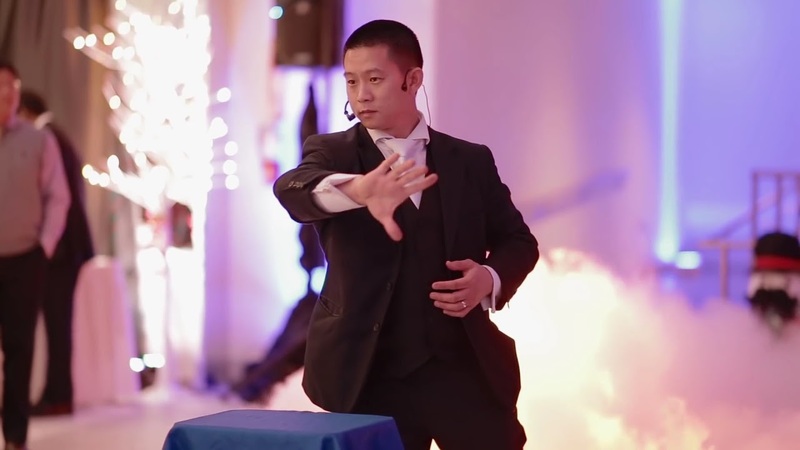 Dan Chan Master Magician performs internationally at corporate events and trade shows, on national television, and private parties. His experience of performing over 5000 shows over the last 15 years has earned him standing ovations, long-term relationships with his clients, and a reputation for excellence. In addition to being called to entertain the world's largest corporations including Google, Yahoo, Intel, Oracle, Quora, and exclusive parties for Silicon Valley's elite, Dan has a family fun show with his 11-year-old son. 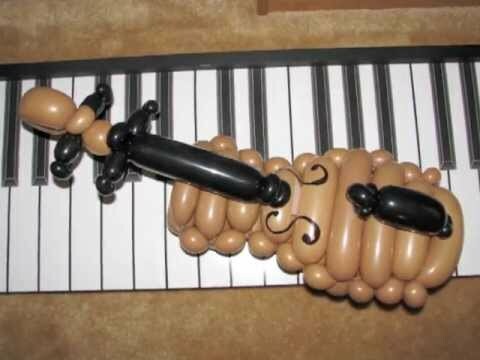 Though the magic show was only somewhat compelling, Colin stayed extra time to be sure every kid got a balloon sword or scepter which was greatly appreciated. Colin performed magic, balloon making and juggling to a group of about 8 kids, all ranging in age (from a baby through to a 16-year-old). He arrived early and was very high energy throughout the show (an hour and 45 mins). It was a Christmas party so people were in and out, eating food, talking etc, so it wasn't a "dedicated audience" type setting. Colin took that in stride and made an effort to provide fun for all of the kids. He also had a super sweet message about how kids can be whatever they want to be, and left a star bracelet with one of the kids, who is probably going to hold on to that for a very long time! Our guests, a group of 20 kids, 6 years old, really enjoyed the show and had lots of fun. Thank you Alex for your performance. Thank you Anca. We look forward to working with you again in the future. Fantastic addition to our picnic! Dan and his young son added a fun experience for our guests at our company picnic. We had almost 2000 guests waiting in food lines and sitting at picnic tables eating, and Dan and his son roamed the crowd providing humor and great magic tricks. They were fun and entertaining - the magic was very impressive. I plan to book them again for our future corporate events. Dan was amazing. You will not be disappointed. Dan Chan was dependable and gave 2 awesome magic shows for the kids. He was entertaining for both kids & adults. He came prepared with his own microphone headset which made a huge difference for our noisy event. His 8 year old son preformed & was absolutely wonderful. I would definitely hire him again. Fred the Magician made our day!!! We celebrated the 5 year-birthday of our son in San Francisco. We invited around 27 kids from 2 to 7 year old and Fred did an amazing job at entertaining them, making them laugh and participate to his show. He also made balloon swords and animals for all the kids...and also fixed them:) We had a blast and would recommend Dan Chan Magic Man to all our friends. Thank you!! Thank you very much for having my team at your event. We've hired Colin from Dan the Magicians group for a 4 year old girls birthday party. The whole experiance working with Dan and Colin was great! Dan was very responsive in getting the schedual correct, Colin made awesome balloons for the kids and was very patent and nice with them. Everyone at the party loved him. I would definetly recommended Dan and his coworkers! I hired Alex Wu through the Bay Area Dinner Show and Dan Chan coordinated the gig for me. Dan was really helpful and helped me decide how to structure the performance for the party and gave me all the details up front. Alex arrived early for the party to see where he'd perform in the house and make sure he was ready to go. He was super personable and did really great walking around entertaining the guests. He did a 20 minute standup show and then at least 40 minutes of walk-around entertainment. He did card tricks, really amazing slight of hand stuff, but really he was a comedian, too. He was really great with people and he was a super fun addition to the party. I'd highly recommend Dan and Alex and I'm looking forward to get seeing their show with all four of the performers. I think Alex said they play at the Dynasty Restaurant in Cupertino at Vallco Mall. We had a show from Dan Chan Magic Man last Saturday. The performers were Alex and his friend. It was an excellent show. The performers were professional and very friendly. They got the pulse of the party and their magic tricks were very good. The kids and adults enjoyed the show thoroughly. Thanks for having us at your event. I'm sure you'll also love our dinner show at www.bayareadinnershow.com where you can see all four Dan Chan Presents performers in a dinner show format. Have a wonderful week! Very Professional & Lots of Fun! From the first contact I had witht them to when they left our facility after the show, Dan Chan & Kat the Acrobat were professional, thorough, and very pleasant. I work at a medium-sized public library and booked them for one of our special Summer reading Club Shows. They packed the place and performed with humor, grace, and skill to a crowd of babies to grandparents. I would hire them again, anytime, and I encourage you to do so as well. 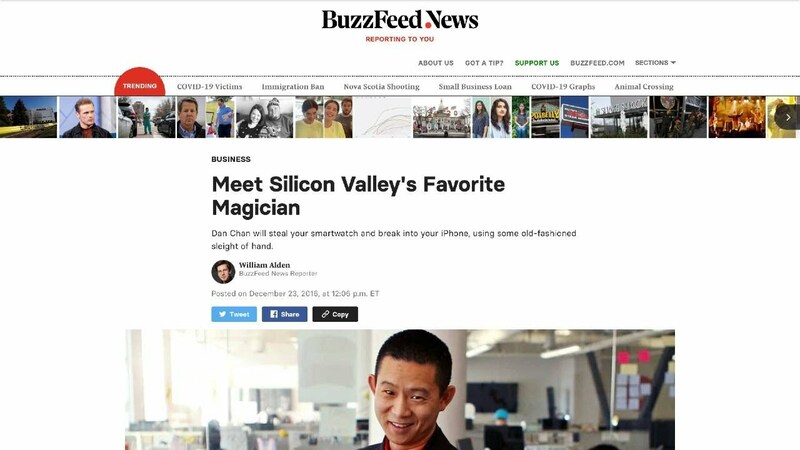 As well as being a talented magician, Dan Chan is approachable, accessible and personable. I have hired several magicians over the past several years, and Dan is on my top 2 list. He did not disappoint. He is able to tailor his performances to fit the audience and occasion. In a word, he's fantastic. Dan Chan Presents newest show Mind Games is about perception. Corporate and tech audiences will be introduced to "Reality Distortion Field" attributed to visionaries like Steve Jobs. The Reality Distortion Field caused by Dan will induce amnesia in spectators causing them to forget how to read, and other mind bending feats. In Dan's prevaricator routine Dan will detect lies, with an unexpected kicker ending. In addition, Dan will also overwhelm the senses. This sensory overload will cause spectators not notice items being removed from their wrist, neck or pockets. The actions and sequences of spectators will be predicted. Spectators will feel pulses of energy across the room. This show is unlike any other. The show is pure variety and skills. Audiences are instantly engaged and wowed with a barrage of magic, juggling, comedy, juggling, and unique stunts which are combined to create the ultimate variety show. Dan will even put his son inside a 6 foot tall balloon to find a select card. This show is a perfect choice for larger events and venues. This signature variety of skills have been featured on cruise-ships, casino grand openings, center stage at circuses and private yachts, World War II warships, theatres, race tracks and even half time events. Find out for yourself why Dan is described as "an intense three ring circus rolled into one man". Recognized by his peers, Dan has been awarded Oakland Magician of the Year, San Jose Magician of the Year and the title of Bay Area's Best Magician. This is the perfect show for larger rooms, outdoor audiences because of this is what Dan has been known for publicly. Climbing into a balloon is one of Kat's most requested stunts. Watch as Kat climb's into a 6 foot tall by 6 foot wide balloon. On occasion Kat will even let the guest of honor climb into the balloon. 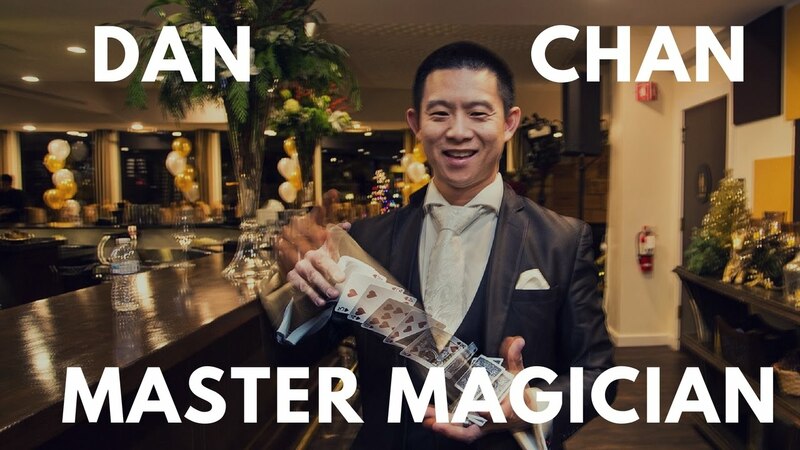 Dan Chan Master Magician has been hailed "an intense, three-ring circus rolled into one man" as a magician, mentalist and mind-reader by audiences worldwide. With over fifteen years of experience, Dan has performed for thousands of corporations including Google, Intel, Oracle, IBM, Yahoo, Cisco and Charles Schwab. He has made multiple television appearances on ABC, CBS, NBC, AFN and MTV. In fact, when 187 billionaires, media moguls, and socialites convened in Sun Valley Idaho for Allen and Company's annual gathering, they chose Dan. The Dan Chan Presents team specializes in corporate events for sophisticated audience and features a magic, mind-reading, pick pocketing and the death defying bullet catch. The Dan Chan Presents team have garnered performances in Las Vegas, Japan, Mexico, Washington D.C., and most recently at the World Famous Magic Castle in Hollywood. Dan is also one of the few performers in the US who performs the ancient Chinese Art, Change of Face. We can provide a full sound-system, spot light, back drop and additional support for larger events. Gold Package - Two person stage show with Dan, and one of his associates. A show with larger production value and recommended for larger audience sized. Plus custom tailored close-up magic effects.